You probably know about the idea behind swapit and our recent presentation of swapit at the Hong Kong ICT Awards 2015. At the same time we are also working hard on getting more users on board. While we are constantly working on improving swapit, the core functionalities of buying & selling items on an individual basis is fully functional. We are working hard in getting the right features, design and user experience into our app, but we need our users’ feedback. Swapit is an app for everyone. First and foremost, we built the app because we saw a need for it. However, the actual users that will carry swapit are the users out there who are looking for a mobile app that just makes their life easier. So to be sure, we are moving the app development into the right direction, we need feedback from our users. A good beta test is only as good as the feedback what you get from your users and – most importantly – the actions you take based on the feedback you have received from your beta testers. In order to ensure we can run our app smoothly during the development & beta stage we need to limit the number of users that are using our app. At least for the beginning. 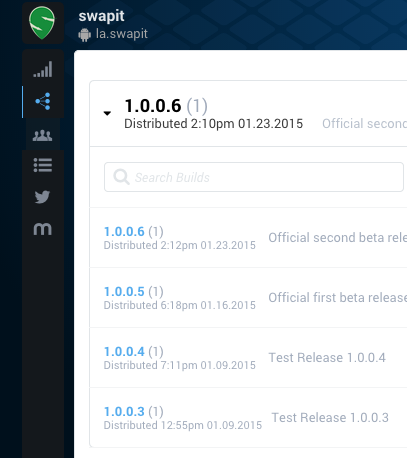 We have set up a simple sign up form for folks that want to request an invitation to our swapit beta test. Just go to http://swapit.la and click “Request Invite”. We at S4BB Limited have been developing apps for over a decade now. From the onset we had been using beta tests during our development process – not in all of the apps we created, but for some of our major ones we did run beta tests before. What’s quite interesting about beta tests, is the fact that there are not many services out there that help developers to manage such. Previously, we did very simple manual collection of our testers’ particulars (name, email address) and later on we moved on to use email services like AWeber and MailChimp. While those services were great to manage the communication between us and our beta testers, there was no facility to manage actual beta release builds of an app and track their progress. Today, we are using beta by Crashlytics which is a service by Twitter, to manage our swapit beta. That service itself is running in an invite-only beta and we were lucky enough to get in and use it. So far we have been very pleased with the features of it and we are looking forward in increasing the number of beta testers for swapit.